The Simms Contender Gore-Tex Men’s Rain Jacket is a men’s rain jacket that is rated for extreme wet weather and is guaranteed to keep you dry. This Simms men’s rain jacket is built with the innovative Gore-Tex 3-layer fabric that is waterproof and breathable and contains a 100 percent polyester face. This men’s rain jacket features Gore-Tex fabric that is waterproof and breathable and will keep you dry in the most extreme weather conditions so you can focus on your fishing and not whether or not your fishing rain jacket can keep you dry because this men’s rain jacket will surely get the job done with style, no matter what mother nature can throw at you. The Simms Contender Rain Jacket comes stocked and loaded with a storm hood that fits easily over headwear with a 3-point cinch that provides fisherman with a very secure fit against harsh weather conditions. 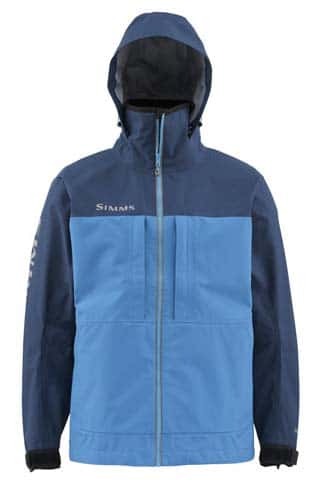 As most fisherman already know, having a storm hood on a men’s rain jacket is a must-have and a great feature of this Simms Gore-Tex rain jacket. The Simms Contender Gore-Tex Men’s Rain Jacket is designed with a mesh-lined vertical chest pocket and 2 zippered hand pockets as well as a YKK AquaGuard Vislon zipper to help resist against corrosion, just one more excellent feature of this quality, perfectly made men’s rain jacket. This Simms Contender Gore-Tex Men’s Rain Jacket also features watertight adjustable cuffs and a dual draw-cord adjustable bottom hem, so you can keep your men’s rain jacket nice and snug during your next fly-fishing getaway while wearing this innovative, feature-rich Gore-Tex rain jacket by Simms. Great jacket to keep you dry! Fits a little big but nothing to complain about. It's super comfortable and does exactly what it's supposed to do. One of the best coat for boat fishin and windy days!